Is iSpot.tv better than YouTube for Commercial SEO? I vaguely recall seeing past TechCrunch articles talking about how a startup called iSpot.tv has been raising rounds of funding and collecting a repository of TV commercials, essentially creating an IMDb for television ads. I remember thinking that if it worked, it would be a cool resource. Yes, I was trying to recall what commercial(s) had used this awesome '70s rock song, and I was pretty sure it was Coors Light. I think the instance above is a pretty realistic example of what a consumer who saw your ad might type into Google when searching for your ad again, or the brand behind the ad they just saw, or the identity of the actors or songs featured, etc. – and iSpot.tv is showing in the top Google search results for this query related to a brand's commercial. I think we’ll be seeing more of this in the future. You might not be that impressed; anyone can optimize a video and get it to rank for a branded query, right? Well, what if I told you that this listing was totally automated and that Coors has nothing to do with it – they haven’t even claimed their brand channel on iSpot.tv yet! Yes, that’s right. iSpot.tv has probably automatically created a “channel” for your brand if you’ve aired a commercial on television - and it’s just sitting there, automatically populating with any of your ads found by iSpot.tv’s proprietary audio and video fingerprinting magic, waiting for you to claim it. And I have to admit – the automated channels and video listings are pretty damn sweet! It’s a lot of work to get my clients’ YouTube channels populated with the kind of rich content iSpot.tv is just scraping and crowd-sourcing, like video titles with optimized, audience-centric keyphrases, unique video descriptions, links to the brands' social channels, and information about featured actors, products, songs, and more. For many brands, posting TV commercials to their YouTube channels is part of their social strategies, and helps them engage with their audiences. Which means that, if brands aren’t seriously on top of their YouTube or Vimeo channels, iSpot.tv is going to be taking away a big chunk of the search engine referral traffic their YouTube channel has been getting for people looking for their commercials. Is It Still Worth Posting Commercials to YouTube? Definitely. YouTube has a massive, engaged audience with more than 1 billion unique active monthly visitors. YouTube reports that users are subscribing to channels by the millions each day, and the number of people subscribing has more than doubled since last year. In fact, according to Nielsen, YouTube actually reaches more US adults aged 18-34 than any cable network. Your brand should definitely be on YouTube, and it’s still worthwhile to post your commercials on YouTube. Not only because of the sheer number of users on YouTube, but also because of the way YouTube suggests videos to users based on what they are watching / have watched, providing an opportunity for your commercial to get more (free) exposure simply because it is related to some other video in some way. Let’s be real - even though the data that iSpot.tv is automatically providing is good, it’s never going to beat a YouTube video custom-optimized by a professional marketer with SEO know-how. Sure, YouTube doesn’t upload and tag your videos automatically like iSpot.tv does, but YouTube provides plenty of optimization opportunities if you’re willing to put in a little time and effort. Besides - your YouTube content strategy should consist of more than just posting TV commercials to your brand channel anyway! Ultimately, even if your channel doesn’t get as many visits from consumers looking for your commercials, you can still create a lot of video content your audience will find valuable; you just have to be creative and get to know the types of content that resonates with your target audience. So What Should You Do About iSpot.TV? I’ll be advising my clients to at least check it out and claim their channel. If there’s a site on the web using your brand’s identity and content, or a hot new social platform, you'd better claim and own your brand's presence! This is especially true if consumers can engage with and comment on that content (iSpot.tv integrates with Facebook for comments). I’ve seen many brands that didn’t create official G+ or Pinterest brand pages early on, or haven’t actively claimed local listings and managed their online reputations effectively, forced to deal with the repercussions of those decisions later on. Learn from their mistakes! Claiming your iSpot.tv brand channel is free, so there’s no reason NOT to claim your brand's listing and monitor the conversations happening around your brand there, even if you don’t want to pay for iSpot.tv’s services. You might be asking, “What are iSpot.tv’s paid services?” I’ll leave it up to them to sell you on it, but essentially, with a paid subscription to the service, you get all kinds of analytics about when and where your TV spots are running, your estimated ad spend, how big your audience was on various channels, and more. You can get your competitors' information too. In real time. If it works as smoothly as they claim (I don’t know anyone using it. Message me or comment here if you or one of your clients has experience with iSpot.tv!) it could be an amazing tool for marketing managers and advertising agencies. However, because iSpot.tv is only tracking commercials that air on national TV, they completely miss viral videos like the recent online-only Jean-Claude Van Damme “Epic Split” Volvo truck commercial. Jean Claude Van Damme Doing an Epic Split for Volvo - Click to Watch on YouTube! As the YouTube stats I mention above show, consumers are spending more time viewing content online - even watching their favorite TV programs online. As a result, many advertisers are shifting marketing dollars away from national TV campaigns in favor of online campaigns. So, naturally, I have to point out that iSpot.tv is only going to be providing a piece of the puzzle for brands looking to monitor the performance of their commercials and their competitors’ commercials – an increasingly smaller piece. Despite the evolution of the way people are consuming their entertainment, there is still a large audience to be reached through traditional television advertising, and many brands are still investing major funds into television marketing campaigns. How many of those brands wouldn't want more data and insight about the performance of their television campaigns - and the campaigns of their competitors? There are several option tiers listed on the iSpot.tv website, but you need to contact them for pricing. If traditional television advertising represents a portion of your marketing budget, you might want to check this company out. Time for a Fun Exercise! Go to your search engine of choice, and enter your brand's name and / or product name with the word "commercial" after it and see if an iSpot.tv listings is appearing in the top search results for that query or if YouTube or some other site is ranking. 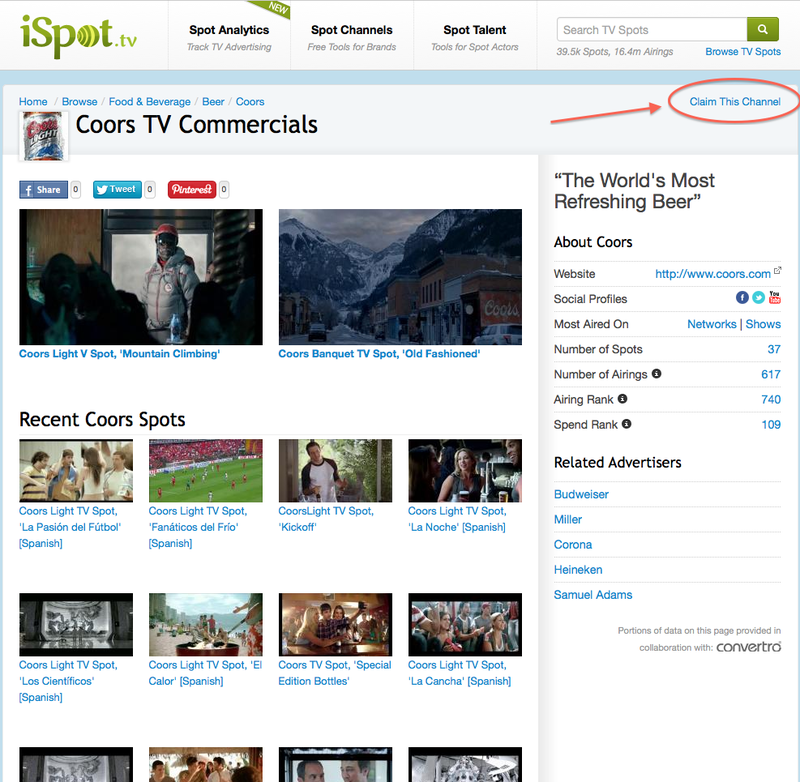 Share your "commercial" related query & where iSpot.tv is appearing in your search results in the comments below!